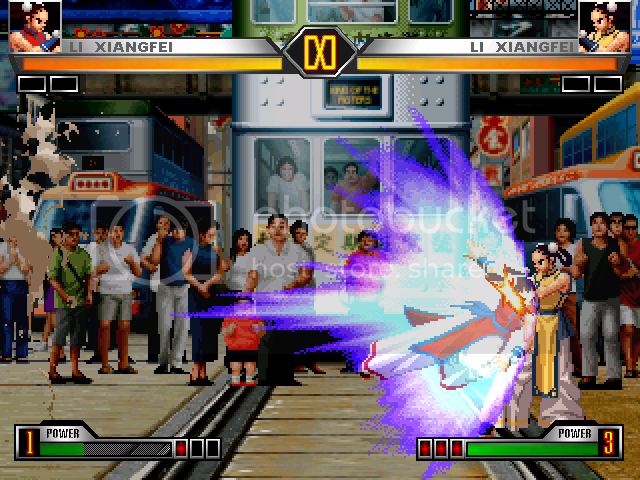 The Mugen Fighters Guild - KOFE v0.9 New Challengers! Figured I do the same thing I did for v0.8 and list the roster upgrades here. First thing's first, Shiki and Neo-Dio have been pulled from the roster. 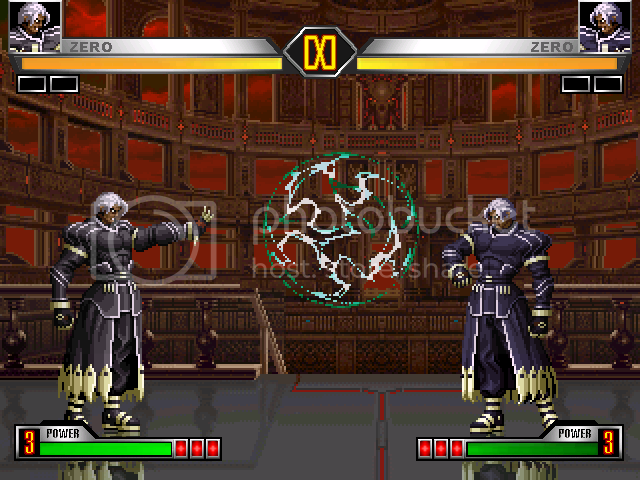 In an attempt to give this game a more KOF feel and because I just really wanted to do Zero, I decided that those slots were better suited to other characters. I feel a lot better about the final roster now even though I really liked Shiki. Both live on in Zero's moveset. There are huge changes to Zero. Probably more than any other character in KOFE. His look is Original Zero, but his sounds are Clone Zero's. He now has a full assortment of basics including jumping basics. 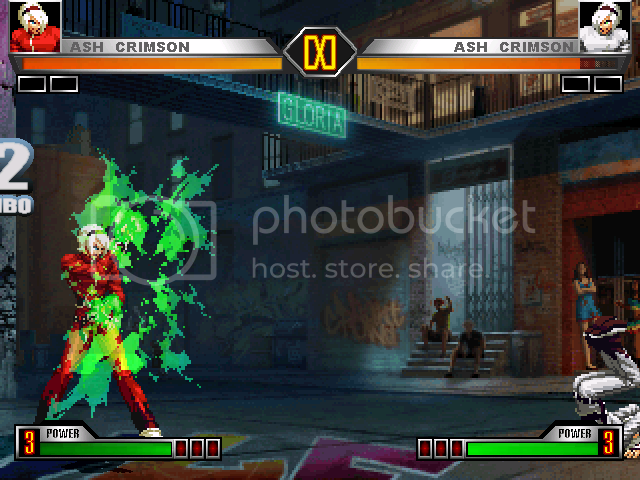 He gains Neo-Dio's "trap" move, a moving raging demon style throw, a large projectile and Neo-Dio's beam DM and his Shadow catch HSDM is a blend of Neo-Dio and Shiki's HSDMs. Ash plays much more like his XIII counterpart than his '03 or Xi incarnations. He has both the candle blow move and dash as a reg special. He also takes some hints from Kain of MotW with a powerful antiprojectile attack before his strong dash and a with his SDM. He has a totally new command grab reminiscent of Kyo's "grab you and blow you up". He also required a completely new kick throw. As with most of the post '02 characters, Liz went through some big upgrades to fill out her moveset. Her Air CD was replaced and the original became a special move. Her counter is more XIII in properties striking the opponent upon connection. She gains a teleport and an SDM throw that looks like a pumped up version of her XIII special command throw. She also gains Benimaru's lost Genri Hurricane as a DM. Blue Mary's kick throw has become her suplex, since both her original throws threw the character behind her. 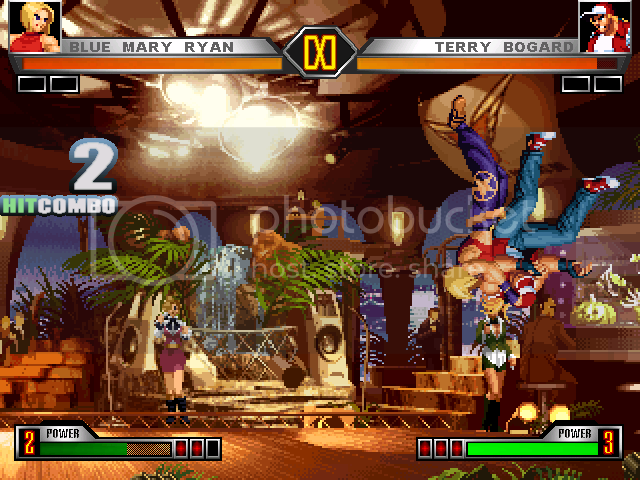 Blue Mary triggered the largest update to KOFE yet when I had to add leg and arm snap animations for each character. Only other major changes include that her arm snap is an air to ground throw, much like her 98UM RB version and her DM anti air is her air suplex (mainly cosmetic). Ralf plays closely to his '98 self. He obtains a new command move and features new 2 victory poses sprited by me. The only major gameplay changes are minimal. He has auto guard on his Ralf Kick start up to compensate for the removal of his running tackle and his tackle DM can only be guarded low. Clark is a fair mix of '98 and '99. His running special grab is now unblockable, but his DM running grab is. 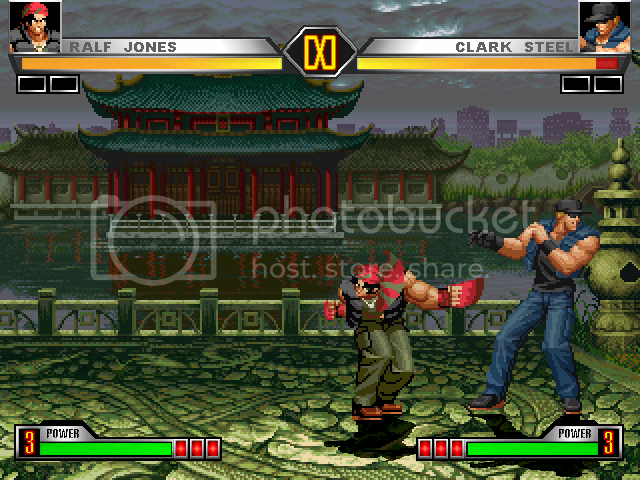 Clark, like Mary, instigated several new sprite additions for all characters just so his DVB looked like it does in the official games. His punch throw is his old backbreaker special from '97-'98. His main changes are that he has an air to ground throw like Blue Mary (the Frankinsteiner), his SDM is a spinning Tiger Bomb and he gains his Neo Max move from XIII as an HSDM. Goro needed to change a lot since he revolves around the instant throws and delayed throws mechanic which doesn't both exist in one character in KOFE (either one or the other). So he has become more counter heavy with a high and low counter and counter DM. 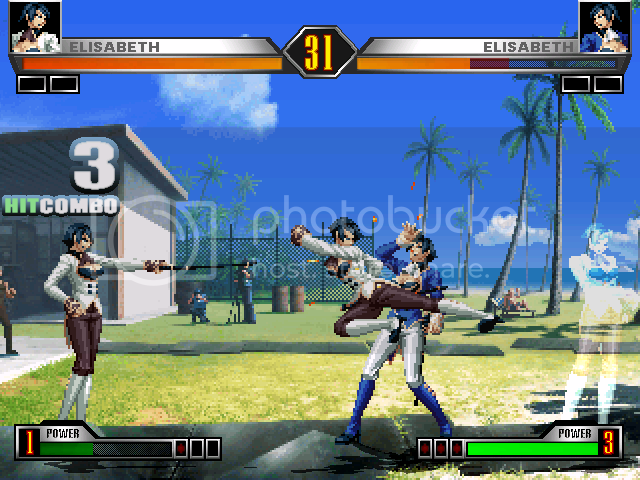 His ground pound was modified since a full screen attack like that is broken in KOFE. The full screen version is now an HSDM based off his XIII NeoMax. His SDM gains a little more impact for style points. Her style remains faithful to her '99 self with a few notable changes in their mechanics. The most noticeable changes are her many changes to her basic attacks which have shifted around a bit. Her weak rising attack now has a more noticeable decrease in vertical travel. Her advancing grab has invincibility at the start. Her drunk punch is now a type 3 counter. She gains a new move that also has an invincible startup. Otherwise it basically functions like Silver's rushing kick. Her SDM gains a new effect and her HSDM whiff functions more like Kensou's. (Note that the vid doesn't show the flip that happens before the rush kick since it was added after). Re: KOFE v0.9 New Challengers! Updated this topic with the final cast for v0.9! Yashiro, Shermie and possibly Shen Woo will come a bit later. 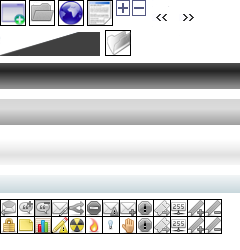 Some of the sprites positioning and landings look really weird. They line up right but the sprites being used look off. LA, you should know that I need more of a definition of "some". Without specifics, I can't figure what you're referring to. I don't like Clarks SDM. I may change it back to the Clark Spark. I reduced the rolling part of it to one roll so it doesn't look as bad now. Will PM you about other stuff. 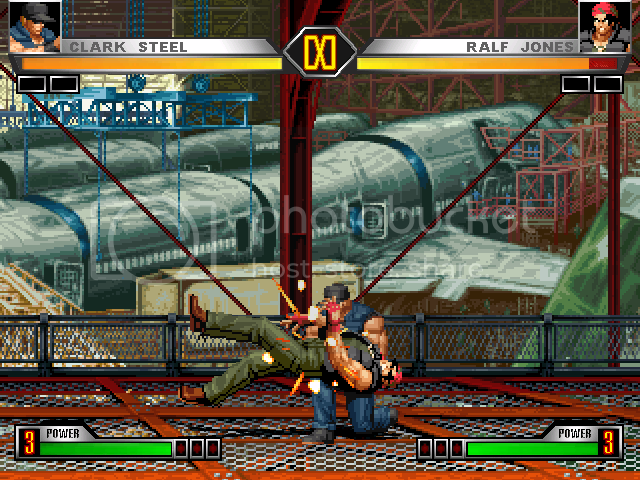 Clark is using the dust effect like he has in KOF XIII. It actually looks better than I expected it to be. If I used the HSDM explod I usually use, it would cover the impact and wouldn't look as good I think. I thought about it when I was making the move. The 8 new challengers shown above are the final roster additions for v0.9. so if Shermie and Yashiro wont make it when is V0.9 gonna be released ? sorry if i am annoying you with this question .